In honor of Hanukah (or Chanukah, or Hanukkah, or however you spell it) I am doing a post on Israeli Wines. Now when I got the email pitch for Golan Heights Winery, I thought the same thing you might be thinking... “They make wine in Israel?” Which yet again reminds me how unworldly Americans like myself can be. Turns out Israel can make Fraking great wines! In March of this year, the winery received the prestigious Gran VinItaly Special Award for Best Wine Producer of the Year at the 19th International VinItaly 2011 Wine Competition (the first winery from Israel ever to be named the best wine producer of the year from the international organization). And it’s not like there wasn’t any competition… 3,720 bottles were submitted by more than 1,000 winemaking companies taking part from 30 countries worldwide. Founded in 1983, the Golan Heights Winery is based in the small town of Katzrin in the Golan Heights region (shocker there). The pioneering moshavs and kibbutzes first planted vines in 1976, and initially the grapes were sold to the large coastal cooperatives. However, local experimental winemaking in 1982 produced results which only underlined the potential and the winery was built the following year. The volcanic soil provided excellent drainage, the climate was relatively cool allowing a long growing season, and water was readily available for drip irrigation in the summer. Golan Heights produces 3 separate labels: Yarden (premier label and flagship brand), Gamla (premium, quality aged varietal wines which are fruit forward and expressive), and Golan (affordable, young, quality wines). 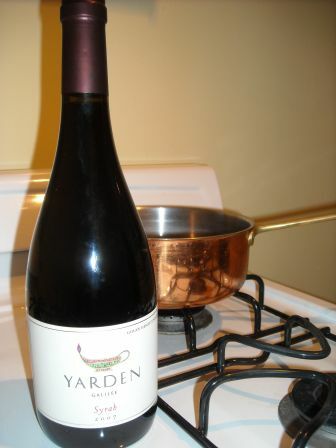 I recently experienced the Yarden Syrah ($25.00). The wine is sourced from the Ortal in the northern Golan and Yonatan and Tel Phares in the central Golan. Rich with notes of Cherry, Geranium, Violets, and Berries, it’s layered with Earth and Chocolate. It opens with a slightly peppery bite that leads into full-bodied flavor with a lightly chewy texture. So yes, it turns out, “They make wine in Israel.” Fraking Great Wine! Happy Hanukah (or Chanukah, or Hanukkah, or however you spell it)! Earlier this year I had the honor of chaperoning five Cambodian kids in SoCal through the Cambodian Children’s Fund (an organization that helps almost 900 children in some of Cambodia’s most destitute communities). It was an eye opening experience that made me recognize how truly blessed we are here in America. It was also a revealing visit on the culinary front as I discovered so much about Cambodian cuisine and culture. And without further ado, here are a couple of factoids that were gleaned during my Cambodian adventure! The staple of a Cambodian meal is rice. The country has lots of waterways (including the Mekong, Sap, and Bassac rivers, along with the nearby Gulf of Thailand) so fresh fish and prawns are very popular in dishes. Beef, pork, chicken, and duck are also popular, but more expensive so less often used in dishes. Some Cambodian delicacies include tarantulas, locusts, and snakes. Along with traditional Khmer (the local culture of the country) Cambodia cuisine draws heavily on the food traditions of their Thai neighbors and Chinese residents. 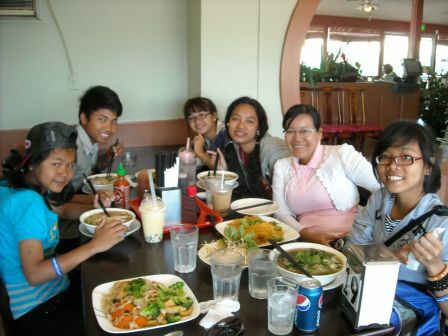 Cambodian is sometimes referred to as “similar to Thai but without the spiciness.” But due to the greasiness of Americanized food (Chinese) and the spiciness (Thai) the five kids were more inclined towards cleanliness of Vietnamese foods. In Cambodia soup is served as an accompaniment to almost all main courses, but not before them as in the West. In Cambodia there are no designated breakfast food (like we have in America). Truthfully the kids thought it was crazy we had certain (heavy) foods that we only ate one time a day. In Cambodia the most popular breakfast is rice noodle soup. Some of the fruits in Cambodia that you might not have heard of are durian, mangosteen, and rambutan. This time of year there’s tons of charities jones-ing for you tax-deductible end of the year money. But when it comes making a BIG change in the world of food look no further than Food Forward, LA's largest urban gleaning organization. 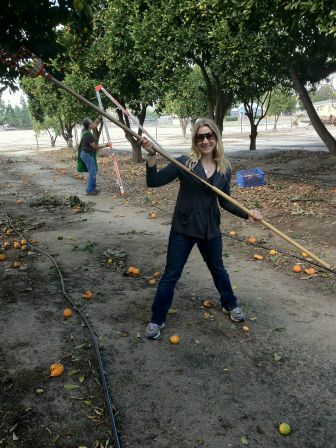 In a nutshell gleaning is when volunteers pick fruit off of donated trees and bring it to SoCal food banks in need. The volunteers get to spend couple of hours in the California sunshine picking fruit and climbing trees (which has the potential to make you absolutely giddy!). SoCal Food Banks such as SOVA and MEND Poverty are happy to receive desperately needed fresh fruit and veggies. The people who donate their trees get a tax write off for the market value of fruit that would otherwise go to waste. And the tree is healthier for being picked of excess fruit. One tree here and one tree there makes a difference! Since forming in 2009, Food Forward has harvested/rescued over 370,000 lbs of fruits & vegetables at hundreds of properties with 100% of what they pick going to feed the hungry. Combined, their distribution partners provide food to over 35,000 clients a month across Southern California. Right now Food Forward is in the middle of a campaign to reach all the food on the tree (versus only the low stuff we can reach with the equipment we have). Below are the Deets. So if you’re looking for something that will put a smile on your face, take that five dollars you might spend on a Latte in the next couple of days and help make a BIG change with a little act! Food Forward’s progress over the last 2.5 years has been remarkable. But as our tiny organization has blossomed over the last two and a half years, we have routinely found we are unable to harvest approximately 25% of the fruit we encounter on any given pick ONLY because we cannot reach it. Something as simple as not having enough of the professional harvesting tools it takes to reach the crown of a tree has hampered us from gleaning literally tens of thousands of additional pounds for the nearly 30 food pantries and other agencies across Southern California whom have now come to depend on us for their supply fresh free local fruit. With a Plum Foundation matching grant - for the first $7,500 we raise from now through the end of this year - we are appealing to you, the beloved members of Fruitland, to DONATE IN ANY AMOUNT to HELP US CLIMB HIGHER AND HARVEST MORE FRUIT. Funds raised during this campaign will go towards purchasing badly needed tools and other items that allow us to continue improving the important work we do in touching the lives of Southern California’s most vulnerable: at last count we have served, over 400,000 people in the past year alone!! Here’s the best part - for those of you Fruitanthropists making (fully tax deductible!) donations at the special levels below during this campaign, there’s a zesty “gimme” simply for stepping up to help us in this special way: For a $100 donation or above you will receive a pair of our nifty Food Forward gloves. For a $250 donation you will have your (or your family’s) name emblemized along with others on a rung of one of our ladders + a pair of FF gloves. For a $500 donation you will have your name emblemized on an exclusive rung of a ladder + a pair of FF gloves. For a $1,000 donation you will receive your name on a top rung + two pairs of FF gloves. For a $2,500 donation you will have an exclusive naming opportunity of an entire ladder with up to five names of your choice to be placed on any of the rungs + five pairs of FF gloves. For a $15,000 donation you will be buying us another badly needed tool: a stake side truck (enabling us to haul upward of 5,000 lbs of fruit at any given time.) For this bountiful gesture your name will be emblemized on the cab of this fine vehicle – and you will help us choose the vanity plate! REMEMBER THE FUNDS MUST BE RECEIVED BY DEC 31ST in order to qualify for the Plum Foundation match. You may donate via PayPal – or check (send to Food Forward 7412 Fulton Ave. #3 North Hollywood, CA 91605.) Either way, when you make your tax-deductible donation, please notify us of: 1) your gloves size S, M, L, XL; and 2) if donating at a higher level, how you would like you or your family’s name to read on the ladder, and; 3) whether or not you would like to be acknowledged on our website. Please allow 2-3 weeks for delivery of your goodies. Every dollar counts, so thank you for a helping make Food Forward’s harvests that much more abundant. Thanks for Sharing the Abundance and helping us do the same. Happy Holidays! See you up a tree! There was an awesome interview on Good Food this Saturday where they interviewed Paul Stamets a mycologist (someone who studies fungi, if you're not up on all your "-ologists") and author of Mycelium Running: How Mushrooms Can Help Save the World. Stamets is a proponent of eliminating pesticides in favor of using fungi that can repel crop eating insects in the fields and prevent termites from eating your house. Stamets owns and operates Fungi Perfecti, an online store selling mushroom cultivation kits and supplies. Truthfully he's a total inspiration to anyone who follows the world of permaculture. His Ted Talk "6 Ways Mushrooms Can Save the World" will blow your mind!